Join host Robert Forto as he speaks to musher, Charmayne Morrison on Mushing Radio. Morrison is a junior musher from Montana and is planning on running the Junior Iditarod in 2018 in Alaska. 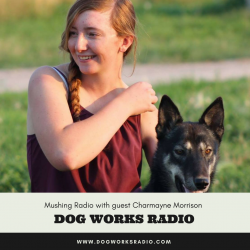 My name is Charmayne Morrison, I am a 16 year old junior musher from Polson, Montana. I am technically a junior in high school but will be graduating a year early, this June. I started Morrison Racing Kennel in February 2014 with three dogs. It has expanded to the 18 Alaskan Huskies that I have now. I am the only musher in my family and I train my dogs completely by myself. In 2015, we ran the 100 mile Junior Race to The Sky. We ended up scratching, however, after taking a wrong turn. Last year, I had the opportunity to handle for another musher instead of racing. This year, I plan to run the Eagle Cap Extreme, Junior Race to The Sky, and the Junior Iditarod. My long term goal is to run Iditarod in 2020.